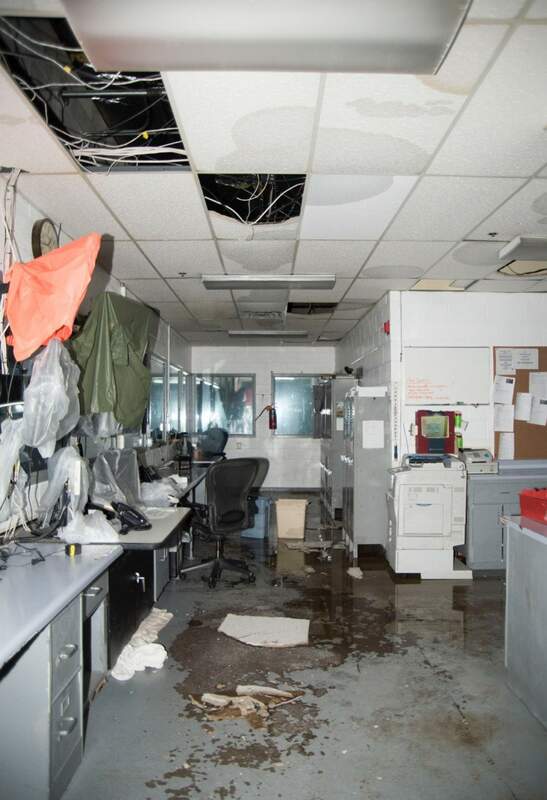 The control room of the Archuleta County jail flooded in May 2105 and forced the detention center to close. Prisoners are being housed at the La Plata County jail, which cost Archuleta County more than $200,000 in 2016. DENVER – Counties across Colorado are spending hundreds of thousands of dollars to send inmates across county lines for incarceration, government officials said Monday at the first County Courthouse and County Jail Funding and Overcrowding Solutions Interim Study Committee. Darius Allen, county commissioner for Alamosa County, said his county spends an estimated $500,000 a year from its reserves to house prisoners in facilities outside of its borders. “Way things are going now, with the housing costs of inmates outside of our county ... Alamosa County will be broke in four years,” Allen said. Archuleta County has a similar problem because its jail was condemned in April 2015, said Sheriff Richard Valdez. The county now transports prisoners who are unable to post a bond or are serving extended sentences to La Plata County. Housing inmates in La Plata County jail cost Archuleta more than $200,000 in 2016 and is estimated to cost more than $250,000 in 2017, Valdez said. These costs did not include the cost of transportation and staff hours for the two law-enforcement officers required for each trip. “It’s an extremely big deal,” Valdez said, not only because of the costs but also the risks in transporting criminals. “... If something happens, where’re the liability issues going to fall?” said Ronnie Maez, Archuleta County commissioner. There’s also a certain amount of pride. “I feel like I’m giving another county our problems, and I don’t like that. We need to take care of our own problems,” Valdez said. Valdez added that transporting prisoners to La Plata County is not sustainable for Archuleta County, so officials plan to ask voters to fund a new jail. The estimated cost is $17.5 million. Counties are required by law to provide a jail and a court. The state pays for operations, salaries and other expenses for the courts, but it does not provide funding to build or maintain these facilities. Lacking the tax base common in more populous counties, it is difficult for rural areas like Archuleta, which has a population of 12,800, to afford jails and courthouses as required by state law. Valdez said he hopes the committee will consider the financial difficulties of small communities when drafting legislation from its series of five hearings over the summer. “The primary thing is to recognize we’re rural communities, and rural communities are lacking resources and that we just don’t have the funding that some of the large communities do,” he said. Sen. Don Coram, R-Montrose and chairman of the committee, said Monday’s hearing showed him that overcrowding and underfunding are not unique to rural Colorado. “Crime doesn’t restrict itself to county borders,” Coram said. Terry Hart, Pueblo County commissioner, said his county struggles with overcrowding to the point that it no longer houses criminals from the city of Pueblo or those convicted of misdemeanors, even if they are jailable offenses. “We are very limited in what we can do. We would love to put a sign up saying ‘no vacancy,’” Hart said. Instead, Pueblo is actively looking for open beds in other county jails in what Hart describes as a “bidding war” to house inmates. This includes an agreement with Douglas County to jail repeat shoplifters who would be released without serving their sentence. The courthouse and jail funding committee will meet again July 21.